Steve Jobs’ impact on this world was impressive. His innovations have likely touched nearly every aspect — computers, movies, music and mobile. But Steve’s greatest legacy may me his set of principles that drove his success. 4. Say no to 1,000 things. Job’s was as proud of what Apple chose not to do as he was of what Apple did. When he returned in Apple in 1997, he took a company with 350 products and reduced them to 10 products in a two-year period. Why? So he could put the “A-Team” on each product. What are you saying “no” to? 6. Master the message. You can have the greatest idea in the world, but if you can’t communicate your ideas, it doesn’t matter. Job’s was one of the world’s greatest corporate storytellers. Instead of simply delivering a presentation like most people do, he informed, he educated, he inspired and he entertained, all in one presentation. There’s one story that I think sums up Jobs’ career at Apple. An executive who had the job of reinventing the Disney Store once called up Jobs and asked for advice. His counsel? Dream bigger. Perhaps that is the best advice he could leave us with. See genius in your craziness, believe in yourself, believe in your vision, and be constantly prepared to defend those ideas. Thanks for Carmine Gallo for this article. KHLB, a Radio station in Mason Texas ran a 60 second ad for a concealed handgun course run by a local gun shop. The ad is voiced by the gun shop owner Crocket Keller. Corus Entertainment Inc. announced its fourth quarter and year-end financial results today. Rogers Communications Inc. today announced its consolidated financial and operating results for the three and nine months ended September 30, 2011, in accordance with International Financial Reporting Standards (“IFRS”). Astral Media Inc. today reported solid financial results for the fourth quarter and the year ended August 31, 2011 and delivered continued growth in revenues, EBITDA1, net earnings, EPS, and cash flow from operations3. “I am very pleased with the strong performance displayed by our three business segments in the fourth quarter and by their balanced contribution to a strong finish to the year. Fiscal 2011 marks the Company’s 15th consecutive year of profitable growth and the first time in Astral’s history that we surpass the billion dollar revenue mark,” said Ian Greenberg, President and Chief Executive Officer. “We are now entering into a challenging economic and advertising environment and remain fully committed to apply the same discipline and focus on cost optimization that have underpinned our past successes”. Apple has sold more than 4 million iPhone 4S units in the past four days, more than double the initial sales of the iPhone 4 in its first three days on sale last year. But it was not all smooth sailing for Apple as technical glitches delayed many new iPhone users from activating their iPhone 4S units on Friday. Apple also had problems with the voice assistant feature called Siri, which had trouble staying active over the weekend. Fortunately, Apple seems to have escaped the bad press that Blackberry has been plagued with recently. News from the Blackberry Developer Conference in San Francisco sees the unveiling of the new BlackBerrry 7 phones that will run on the BBX platform which promises to connect people, devices, content and services. Also shown for the first time were some new advanced graphics, which boast advanced capabilities, including deeper integration between apps, always-on Push services, and the BBM Social Platform. The new Blackberry 7 phones will go on sale in early 2012 in the hopes of grabbing some attention away from the iPhone and Android phones. 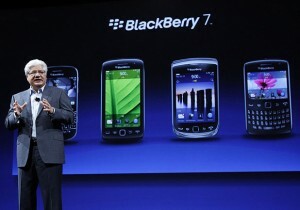 RIM has sold 165 million BlackBerrys through August. Apple had sold 129 million iPhones as of June, but its device has been on the market for a much shorter amount of time. We think this means more people will be carrying smart phones capable of listening to and interacting with a radio station. So this is a great time to ensure your radio station has a presence on the Blackberry, Andriod and iPhone platforms. Mobile commerce is growing fast. While it took 15 years for e-commerce to reach 5% of retail sales, it seems mobile will be at that level in three to five years. SapientNitro’s “Insights 2012” report delves into mobile technology and marketing. Media Post gives a review of this research here. Who Would Want Konrad’s Job? In a 25-year career in Canadian broadcasting that has included countless CRTC hearings, Jay Switzer has only once been ruled out of order. It happened in 2007, early in Konrad von Finckenstein’s term as CRTC chair, during a public hearing for new radio licenses in Western Canada. Switzer, who is now chair of the broadcast start-up Hollywood Suite, says that such rigid adherence to protocol, combined with a genuine desire to make the CRTC both more responsive and transparent, is emblematic of von Finckenstein’s term as head of the federal telecom/broadcast regulator. Just as emblematic, von Finckenstein’s detractors claim, are a tendency towards bullying and a distinct lack of vision that prevented him from grasping the full impact of new technology and how it fits within Canada’s regulatory framework. The von Finckenstein era will conclude in January 2012, five years after it began. The Harper government recently declined to give the one-time Justice of the Federal Court and former head of the Competition Bureau a second term. Whether or not he’ll be missed is open to interpretation. His job was a tough one: big telecommunications companies wanted (and expected) someone not quick to impose new regulations. He disappointed. While consumers (or at least the self-anointed consumer rights groups) wanted someone to rein in those big telcos. Hard to meet that mandate. His tough, no-nonsense approach didn’t exactly endear him to the participants on both sides of the regulatory process who have been castigated during public hearings and had multiple failed bids for licenses and new regulation quashed. “He treats everyone who comes before him with a certain severity,” says Steve Anderson, founder and executive director of Vancouver-based Open Media, a not-for-profit organization that led the charge against usage-based billing earlier this year. Anderson says von Finckenstein has a “mixed legacy” as CRTC chairman, presiding over the introduction of welcome regulation regarding diversity of voices, yet simultaneously “insulated” from public opinion and far too close to the industries he was tasked with regulating. Under von Finckenstein’s watch, says Anderson, the country’s biggest media entities—Bell, Rogers Communications, Shaw Communications and Quebecor—have become more profitable and have a greater stranglehold on the telecom and broadcast sectors than ever before. “Clearly the big telephone companies have done very well and ordinary Canadians have not,” he says. As evidence, he points to a June 2010 report by the Organization for Economic Co-operation and Development (OECD) which ranks Canada 27th out of 29 OECD nations when it comes to monthly subscription fees for a high-speed internet connection. The average price of $64.72 is more than double the average of $29.40 for first-ranked Greece. Asked last week to assess von Finckenstein’s legacy as CRTC chair, Bell declined comment, perhaps confirming the adage “If you can’t say something nice…” If Bell’s decision to buy CTV late last year was based largely on the expectation of gaining the right to stream the network’s content to Bell’s wireless subscribers, it’s safe to say Bell will be happy to see him go. It’s widely believed that frequent clashes between the CRTC and the governing Conservatives were key factors in his being granted only a single term. Recently, it was over usage-based billing. But perhaps most contentious was the CRTC decision to deny a license to Wind Mobile after it deemed that its owner, Globalive Wireless Management Corp., did not meet Canadian ownership requirements. The decision was overturned by cabinet and ultimately ended up in court. But some industry observers say it was because of von Finckenstein’s unwillingness to be a puppet for the Harper government that the CRTC was so progressive during one of the most tumultuous periods in Canadian telecom and broadcasting history—an era characterized by massive consolidation and technological advances that reverberated through the bedrock of the broadcast system. To read the full article in Marketing, subscribe now. Radio stations have been offering half priced deals for listeners for several years, but these services have really taken off with the recent arrival of the likes of Groupon and Dealfind. Perhaps this is due in part to the economy, or perhaps it is because of a greater awareness of these services, but whatever it is, recent research conducted by Borrell Associates amongst 40,000 consumers indicates consumers not only love the deals that many radio stations offer, but they’re also eager to sign up for more. And a simultaneous survey of more than 700 local advertisers shows that deals are driving a significant amount of new business as well as repeat business from those new customers. * 44% have signed up for four or more e-mail lists. * 45% of the business generated from deals comes from new customers, and 22% of those become repeat customers. Listen in on the webinar, live, on Oct. 13 by registering at Borrell Associates. OTTAWA-GATINEAU, October 5, 2011 — Today, the Canadian Radio-television and Telecommunications Commission (CRTC) announced that its fact-finding exercise on the nature and implications of online and mobile broadcasting activity produced inconclusive results. The CRTC will continue to monitor the evolving communications environment, and this growing activity will be the main focus of its annual consultation with the broadcasting industry in November 2011. The traditional broadcasting system continues to support Canadian programming even as services emerge to deliver content to Canadians in new ways. While consumption of online and mobile programming is growing, current measurement tools are unable to accurately reflect trends in consumer behaviour. There is no clear evidence that Canadians are reducing or cancelling their television subscriptions. Online and mobile programming appears to be complementary to the content offered by the traditional broadcasting system. Canadian creators are taking advantage of the digital environment to produce innovative content and to reach Canadian and global audiences. Canadian broadcasters and distributors are also launching their own online and mobile programming services. Some online programming services have established viable business models and are competing in the marketplace for programming rights and viewers.